ExpressVPN is a British Virgin Island-based service that was launched in 2009. It’s gone on to become an industry-leading VPN provider. Features include zero usage logging, a generous 30-day money-back guarantee, and blazing fast speeds. It has servers in 87 countries and counting, as well as dedicated apps for just about every device. Read our detailed ExpressVPN review below to find out more about this fantastic provider! ExpressVPN is the perfect combination of speed, security, and streaming-friendless. A little on the expensive side, but you get what you pay for – a truly stellar VPN service! ExpressVPN has always been at the front of the pack when it comes to offering a fantastic customer experience. Central to this experience is a 30-day money-back guarantee (which it fully honors), round-the-clock customer support, and easy-to-use apps for all major platforms. This British Virgin Islands-based VPN provider has now also buffed up its technical security, offering fantastic OpenVPN encryption. If bought on a monthly basis, ExpressVPN costs $12.95 per month. This is definitely at the pricier end of the VPN spectrum. However, an annual subscription drops to a much more reasonable $8.32 per month. One of ExpressVPN’s strongest selling points is its industry-leading, no-quibble, 30-day money-back guarantee. This means that there is very little reason not to at least try out the service! This acts in lieu of a free trial for the full desktop service. Mobile users can also try out ExpressVPN before laying down any cash (one week for iOS devices and one day for Android users). Support for the OpenVPN, PPTP, L2TP/IPSec, and SSTP VPN protocols. Unless your device does not support OpenVPN, I recommend always using that protocol. “Stealth servers” – these are located in Hong Kong and allow users in mainland China to bypass the Great Firewall. They should also be helpful for users in other countries where the internet is censored (such as Iran or Turkey). A .onion website – again, this is a great anti-censorship measure. It allows users to connect to the ExpressVPN website anonymously over the Tor network, even from places where access to ExpressVPN is censored. To access this special website you must use the Tor Browser. Works with US Netflix and BBC iPlayer. Total amount of data transferred per day. Dates (not times) when connected to the service. For most users these minimal connection logs are unlikely to be of much concern, but those with a very strong need for privacy might prefer a service that keeps no logs at all. The BVI is a former British colony, and although internally self-governing, it remains under the jurisdiction and sovereignty of the UK government. What all this means in terms of GCHQ spying, I have no idea. ExpressVPN has dedicated apps for Windows, Mac OS/OS X, Android and iOS. It also has a dedicated app for Linux. This is command-line only, but does include DNS leak protection. 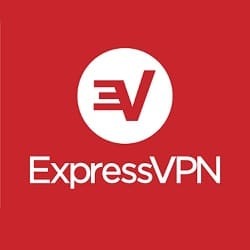 ExpressVPN also supplies a wide selection of guides to setting up its service on a variety of platforms, and using a variety of VPN protocols. Various router setup guides are also provided, or you can flash a router with ExpressVPN’s custom router firmware. Pre-flashed routers are available for the fainter of heart. The first step is to sign up for the service. A valid email address and payment details are required, but you can improve privacy by using a disposable email account and paying with properly mixed Bitcoins. Please always be aware, however, that as with any VPN service, ExpressVPN will always know your real IP address, no matter how anonymously you sign up for the service. For this review I tested ExpressVPN’s Windows and Android apps. As I have already mentioned, ExpressVPN excels at providing a great customer experience. One aspect of this is providing easy-to-use software that “just works,” but which also provides all the most important features that VPN users actually need. Just hit the big green button and go! 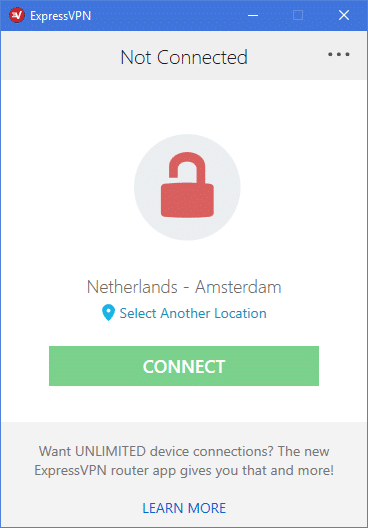 The client allows you to easily switch VPN protocols. It also includes DNS leak protection and a kill switch (courtesy of its “Network Lock” firewall). 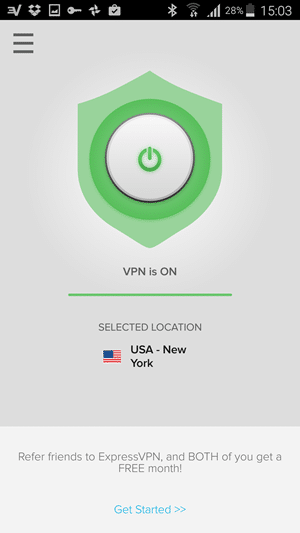 Much like the Windows app, the ExpressVPN Android app is simple to use. It prevents DNS and WebRTC leaks. There is no kill switch, however. Perfect Forward Secrecy (PFS): yes, using an ECDH key exchange. PFS means that new keys are generated on each connection. So even if the OpenVPN encryption is somehow compromised (which is very unlikely, given the above encryption suite), only data relating to a single session can be obtained. Each new session would require re-cracking OpenVPN. Unlike many VPN providers, ExpressVPN creates a custom OpenVPN certificate for each user, which is then authenticated using a special code. This is more secure than using generic certs and simply securing the connection with a username and password. As encryption and security goes, this is all pretty much flawless. I ran each test five times. The screenshots show the best download result, with lowest and average results noted below. Lowest: 34.92/2.44 Mbs. Average: 37.65/2.49 Mbs.These are very respectable speed results, and I discovered no DNS or WebRTC leaks. I am also pleased to report that, despite their bans on VPN use, both US Netflix and BBC iPlayer work just fine using ExpressVPN. The ExpressVPN website matches the professionalism and attention to detail shown in all other aspects of this provider’s service. It looks good, and a huge amount VPN-related information is available. The only slight criticism I can raise is that some information is not quite as easy to find as I would like. As noted in the introduction to this review, ExpressVPN has in large part built its reputation on providing exceptional customer support. The easiest way to access this is via year-round 24/7 live chat. It really is difficult to argue with this level of service! In my experience, the front-line support staff is best at handling billing enquires and suchlike, but are quick to refer you to more technical resources, or pass you on to tech experts if needed. 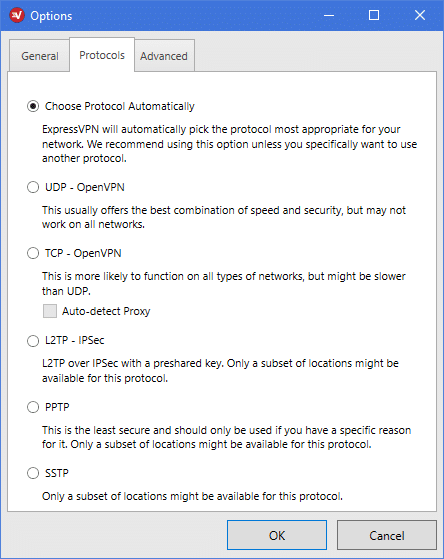 Should I Subscribe to ExpressVPN? Other than keeping a few (fairly minimal) connection logs, there really is almost nothing to complain about with ExpressVPN. The service oozes professionalism and polish, uses fantastic encryption, does not leak your IP address, has servers almost everywhere, throws in a Smart DNS service for free, and provides 24/7 support. If you are still not convinced, the 30-day money-back guarantee allows you to check out the service for yourself at your leisure! At the more expensive end of the spectrum, but you get what you pay for: a full Smart DNS service is included. Such a great vpn service. And great review you have done a great job. I didn’t found any other review site with such great insights about express vpn. 2 days ago I bought expressvpn from this site. Thankx for pointing out its features and its setup. Your tutorials helped me a lot to setup express vpn on my iMac. The ExpressVPN website promotes a couple pre-configured Linksys routers you can order directly. But they also have setup tutorials for many other popular routers, including the top end routers from Asus or D-Link. They have a router compatibility list on the site. Check it out first. I think the bulk of their business comes from China. Internet freedom and bypassing government restrictions is their main selling point. I’m an American, working in China and this is the most reliable service I’ve found to get through the Great Firewall. It let’s me access YouTube and Facebook and all the other restricted sites with ease. Plus, they have quite good customer support. 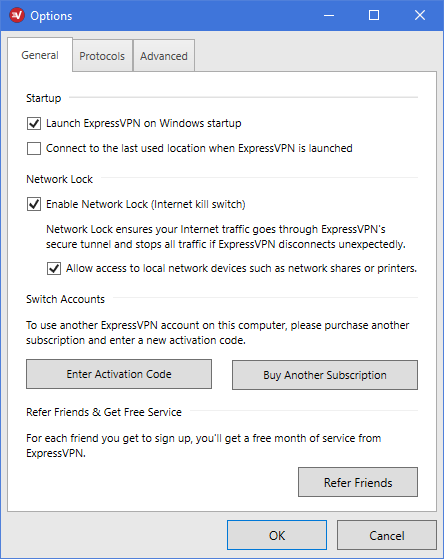 Hello, is express vpn available for windows10? Yes, ExpressVPN is available for Windows 10 and working like a charm. I have been using it on my laptop. Speed is pretty good for downloading and streaming. We will appreciate, if you let us know your experience about their services. Can I configure the vpn on my router AND my tablet/laptop? I would like to be protected within my wifi and also outside in public. Is this workable? Is it not recommended for any reason? You can easily configure it on your router for safe surfing. We are gradually updating this Express VPN review, in near future we will update its setup process for different routers. We recommend ExpressVPN for almost all purpose like streaming, downloading, unblocking, WiFi security etc. I’ve been though a lot of VPNs in the past year but this one is the most stable. So far so good. This is the one I recommend to all my friends visiting China. If you don’t know what to get just get this one and you’re good. Used it on my last trip to China. Google, Facebook, YouTube, Twitter all work fine. Thank you Sofia, that is why we at VPN Analysis recommend ExpressVPN as “one fit for all solutions”. I work in China and this is the one my coworker recommended. Can’t complain. I run it though my iPad and Mac with no problems at all. Best VPN service I’ve found. The staff are really helpfull no problems at all. The review states that, “ExpressVPN only allow two simultaneous devices per account, . . .” Does this mean that ExpressVPN can be loaded on only two devices OR that it can be loaded on several devices (under the same account) but that only two of those devices could use ExpressVPN at the same time? i have the $99 option and it saves me a lot of money every month. i use this on my ipad and my girlfriend can use it on her computer so its great. It’s the latter. You can load on as many devices as you wish but only 3 simultaneous connections at a time. If it’s running on your router that counts as one connection. works on your iphone when you are out and about as well, so thats great! Can you tell me if ExpressVPN protect us from malwares or viruses? Or i have to install anti-virus other than ExpressVPN in my system? I am pleased to answer your query…Well, ExpressVPN is capable to assure supreme privacy and bypass on all your internet activities. When you are connected to ExpressVPN, it creates a secure tunnel between you and your server so that you won’t have any fear of data theft. Hence, safeguards you with secure tunnel. I hope you have got cleared. No, it won’t protect you from viruses or malware directly, but it offers some protection from hackers. You will still need an anti-virus software. what attracted me to expressvpn was their commitment to my privacy. I honestly do trust them not to track and store my data, which icant honestly say the same about other providers. no issues from me. ive been using this for just over a year now, and will definitely keep using it in 2016. Express has always beens super fast in my experience! Streaming Netflix in HD! Public wifi networks are not to be trusted! I always switch on Express at cafes and other hotspots. I use ExpressVPN to watch BBC iplayer from the US on an almost daily basis. was on the fence about whether i needed a vpn for a long time, but since HTTPS got hacked I definetely don’t feel safe without one. express vpn is on fleek! Express VPN has a great iOS app. expressvpn has it all. all other ones sacrifice speed or security or design. VPNs are a necessity for almost every expat in China, and express VPN is the cream of the Crop. if a show isn’t available on Netflix because you’re not in the US just get a VPN to connect to USA server like ExressVPN. 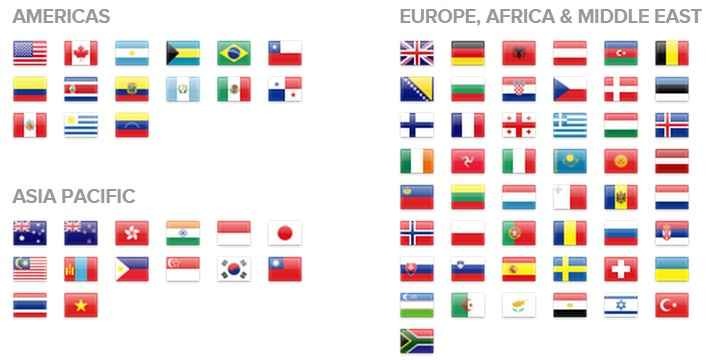 ExpressVPN is great for digital nomads who want something fast and simple witha lot of countries co choose from. I just don’t trust free vPN services. They are really good but like someone else said.. speeds have went DOWN! This is really useful when you’re travelling. I’m an English teacher in China and ExpressVPN is literally the key to keeping in touch with my friends and family. Service fast, connect to LA3 for best speeds. Love you expressvpn! I will be traveling to Saudi Arabia for a couple months, and wanted to see what would be the most recommended VPN service to get. Thanks in advance! Recent additions of Linux app, network lock, and more simultaneous devices shows Express isn’t resting on its laurels. Express DOES work with Netflix, just ping customer support and they’ll point you to which servers are working. Express streams Pandora from everywhere in Europe with no trouble! I set up Express on my router and run Chromecast through it on my TV. Works great! I recommend Express for anyone traveling to China. Had to see for myself why so many people use Express and it really is pretty great. ExpressVPN works with Roku but you have to set it up on your router. Loving the ExpressVPN iPhone app! Very simple and stable. ExpresVPN is the easiest way to ensure your privacy online. A VPN like Express plus an anti-tracking browser extension like Disconnect can go a long way in protecting privacy. Support VPNs like Express who don’t log and incorporate outside of surveillance states like UK and US! ExpressVPN is a relatively big company and would have a lot to lose if it sold out to govt or corporations and leaked user info. That’s why I trust it over the less popular VPNs. Thank you Tom, that is why we at VPN Analysis always recommend ExpressVPN as “best fit for all solutions”. The only complaint I have is that it’s slightly pricey. Other than that I’m extremely satisfied. Perfect for traveling. As far i’m concerned this is as important to pack as underwear is. I use it to bypass firewalls and internet restrictions. Helps me keep in touch with friends and family back home. Really very happy they added the network lock feature a while ago. Before, when my vpn would cut out my info would become instantly exposed. Now I don’t have to worry about that.